TONIGHT! 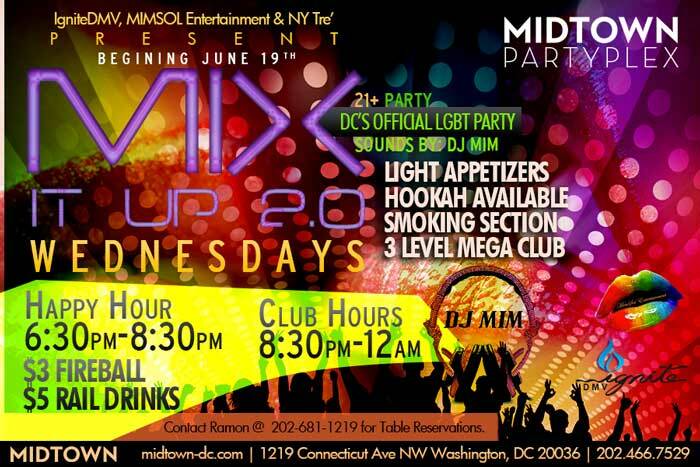 We launch #LGBT Wednesdays at Midtown in DC 6:30p-12:00a! Each and Every Wednesday starting TODAY!! This entry was posted in DJ MIM, Events and tagged DC Gay Nightlife, dj mim, DJMIMDC, Gay Event, Ignite DMV, LGBT, Midtown, mimsol, MimSol Ent, MimSol Entertainment, Mix It Up 2.0, Mix It Up Wednesdays, SocaSol, washington dc by MIM Entertainment. Bookmark the permalink.